Where are you from? I have retired to Duncansville, Pennsylvania. Previously, I lived and worked in Detroit. When and how did you become interested in paddling? Just about everyone who lives in Michigan has a canoe. Kayaking was a natural transition. Where is your favorite place to paddle? We spend time each year in Key West, where we link up with an informal kayaking group called the Green Parrot Kayak Club. I love exploring and paddling the flats off Geiger Key and other areas. The birds and marine life are incredible. What’s the most interesting thing that ever happened to you on a paddling trip? Last year my son went with me on the Suwannee River trip in October for the first time. He couldn't believe the springs and caverns. We tried to snorkel every spring we came upon. While walking up Anderson Run we bumped into Eric, who likes to snorkel and explore the caverns as much as I do. We proceeded to the spring head and found a cavern in the middle of the spring. We took turns exploring the cavern which was very unique. How many Paddle Florida trips have you gone on and to where? 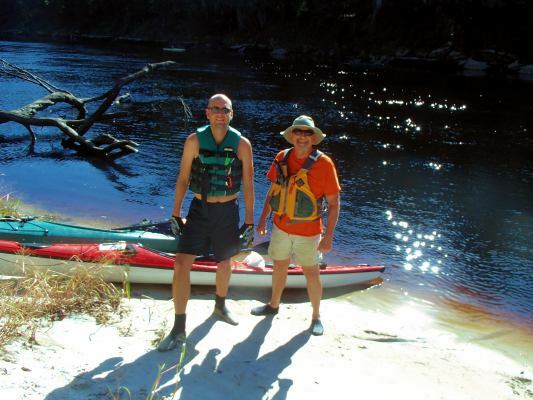 I've been on several Suwannee River trips over the years. I rented a kayak the first time, but afterwards I bought a 16.5’ sea kayak. Can you describe a Paddle Florida trip highlight? The entertainment and speakers are a definite highlight. After a day of paddling, listening to bluegrass and folk music followed by a campfire is hard to beat. What advice do you have for folks considering a Paddle Florida trip? Do it. You don't have to be an experienced kayaker. Bring someone with you so you can share the memories afterwards. The springs are amazing. I look at my pictures often and look forward to the next journey.